So we’ve noticed some buzz on the Internet lately about the backdrop to Conan O’Brien’s Tonight Show set. The guys at Serious Lunch posted the backdrop, and what appears to be a doctored version of the backdrop, adding in various elements from the Mushroom Kingdom from Mario Bros. An animated GIF with the two images can be seen here. Folks are speculating about the similarities, so we thought we’d take this opportunity to discuss what kinds of copyright issues might be present here. And because the issues are different, we’ll treat two possible “defendants” – 1) Conan and 2) the folks who created the doctored version of Conan’s backdrop.In order to prove copyright infringement, a plaintiff must demonstrate two basic elements: 1) ownership of a valid copyright, and 2) copying of protected expression. The first element, ownership of a valid copyright, is usually an easy element to prove. Copyright protection exists from the moment that an author fixes a work in a tangible medium of expression. So the moment an artist puts brush to canvas, or when a writer puts pen to paper (or hits the “save” button), a copyright exists. The result is the same when the “author” is a computer game artist. At some point the artist drew the Mario images, either on paper or on a computer, both of which are tangible media of express, and both of which would result in a copyright for those images. There might still be some issues of whether the artist that drew those images came up with the original concept himself or herself, as opposed to copying it from yet some other source, but let’s assume the design is original to the author. The author worked for Nintendo (another assumption), and so Nintendo owns the copyright because that was created by an employee in the ordinary course of employment and is therefore a work made for hire under U.S. copyright laws (we’re also assuming U.S. law applies, because we’re not Japanese legal experts :)). The second element, copying of protected expression, is a little more difficult to prove. Copying is proven by either direct proof of copying (e.g., offering testimony from someone who actually saw the alleged copier copy the protected work – this hardly ever happens), or with indirect proof of copying (which is more common) by demonstrating 1) access to the protected work + 2) substantial similarity between the copied work and the alleged infringing work. Access can even be inferred when the two works are strikingly similar such that no reasonable person would conclude they could be that similar absent some level of copying. Access can be proven either by direct evidence, i.e., the alleged infringer admits that he or she had access to or otherwise reviewed the copyrighted work, or by circumstantial evidence, e.g., through widespread dissemination of the copyrighted work to the public. Nintendo has certainly sold its fair share of Mario games. Indeed, one web site estimates that Mario games have sold over 160 million copies starting with Super Mario Bros. on the Nintendo Entertainment System (NES). Widespread dissemination appears to be present. However, how many of those copies included the stuff in the images above? We’re guessing the answer is still in the millions. Ok, assuming there is access to Nintendo’s stuff by both Conan (or his designers) and the folks who created the doctored image, is there also substantial similarity? What amounts to substantial similarity? Different courts have used different tests, but it boils down to a determination of whether there is a remarkable resemblance between the original and allegedly copied works. Here the analysis is a bit different between Conan and the doctorer. Does the Conan backdrop, without the stuff added in the doctored image, look like any Mario game screen or image? How about the version created by the doctorers?Even if there is access + substantial similarly, designers over at NBC, or the creators of the doctored version, might still have some defenses they can rely on. First, independent creation is a complete defense to copyright infringement. If the designers or doctorers can prove that the similarities between their respective images and Mario’s stuff are simply coincidence, then there is no infringement no matter how similar the two works are. In addition, they might be able to demonstrate that their use is a fair use of the copyrighted work. A fair use of a copyrighted work is not infringement. Fair use includes “such use by reproduction in copies or phonorecords…, for purposes such as criticism, comment, news reporting, teaching (including multiple copies for classroom use), scholarship, or research.” 17 U.S.C. sec. 107. Other uses might also be fair uses of the copyright work, based on an analysis of the following four factors: (1) the purpose and character of the use, including whether such use is of a commercial nature or is for nonprofit educational purposes. NBC is a commercial entity whose primary purposes is to air entertaining television shows that draw an audience, allowing them to sell commercials to advertisers for financial gain. The Tonight Show, however, does have a news component to it, insofar as it discusses current events, interviews notable figures, etc. The folks who created the doctored image appear to have done it simply to make an editorial point. (2) the nature of the copyrighted work. This factor is analyzed based on whether a copyrighted work is creative versus factual. Art, fiction, and sculpture are purely creative, and therefore receive stronger copyright protection than factual works such as compilations of historical facts, news articles merely providing factual content, and nonfiction books. The elements of Mario’s games are artwork, and appear to be a creative work deserving strong copyright protection. (3) the amount and substantiality of the portion used in relation to the copyrighted work as a whole. This factor raises an interesting question: What is the copyrighted work that was allegedly copied? 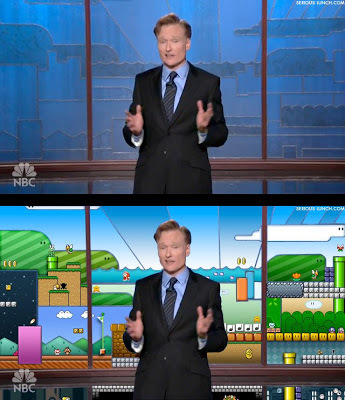 In the Conan backdrop, is there even any Mario game screen having an outline that looks like that backdrop? In the doctored image, if the individual elements were copied (e.g., the Oompa Loompa mushroom by itself) from a Nintendo work, then how much of that work was just the Oompa Loompa? Some courts also look at what components the U.S. Copyright Office included within the registration certificate. We have no knowledge of whether Nintendo has registered its copyright in the elements of the Mushroom Kingdom or not, but Nintendo could register the copyright in the individual screenshots and elements (e.g., the Oompa Loompa mushroom) making up the panels allegedly copied for Conan’s backdrop. (4) the effect of the use upon the potential market for or value of the copyrighted work. This factor is often given more weight than the orthers, sort of under the theory “no harm, no foul” (that’s not legalese; just an analogy). We doubt that Nintendo was making much business off of licensing its works for set backdrops, but you never know. Courts also look to potential markets for copyrighted works, so if there is a possible market in this area, that could be taken into account. Another possible defense is to argue that the works are not substantially similar at all, but rather Conan’s backdrop and/or the doctored image are so transformative from the original inspiration that they can only be said to contain a similar “idea” but that the “expression” is different. This is known as the idea/expression dichotomy of copyright law. Copyright does not protect ideas; copyright only protects the actual expression of an idea. And as a final note, the U.S. Copyright laws include a separate provision for infringement by “derivative” works. A classic example of a derivative work would be when an artist cuts up a bunch of copyrighted images and makes a new collage out of it. The doctorers here may have arguably created a derivative work, if they copied snippets from various Mario games. What do we think? Well, being that we are attorneys, and that we don’t have all the facts, we will keep our opinions to ourselves. You never know what facts will come to light when two parties get in a dispute, and the game can change in an instant when there is a new development. Could it be a parody and therefore protected by the First Amendment? Could it be independent creation? Could it be de minimus copying? Could it be fair use? It could be any of the above given the right facts. Heck, this could be one giant publicity stunt: NBC or the doctorers might already have a license from Nintendo, and this could all be for the sake generating publicity when the cult of gaming elite inevitably notices the similarity.